Imperialist intervention in Venezuela is now an issue of widespread discussion. Similar examples are cited while discussing the intervention in Venezuela. Syria is an example. Syrian President has cited the example himself. The war in Syria has much in common with the political crisis gripping Venezuela, where outside players try to meddle in domestic affairs and undermine sovereignty, Syrian President Bashar Assad told Venezuela’s Foreign Minister Jorge Arreaza. “What is happening in Venezuela is similar to the developments in Syria,” Bashar Assad told Jorge Arreaza during the Venezuelan Foreign Minister’s visit to Damascus. Assad claimed: Those interfering in both crises seek “hegemony” over Syria’s and Venezuela’s sovereignty. Arreaza visited Damascus while touring other countries in the region including Turkey and Lebanon. Imperialism has mulled the so-called “humanitarian intervention” in order to remove the unwanted government of Nicolas Maduro from power. The Syrian conflict started on the heels of anti-government demonstrations inspired by the 2011 Arab Spring unrest. Protests erupted in several major cities, with opposition protesters demanding that Assad step down. Some of the anti-government groups took up arms and the violence rapidly escalated, sending the country into civil war. Imperialism unambiguously supported anti-Assad factions, declaring that the president has “lost” his legitimacy. Militant groups took over control of vast parts of Syria during the civil war chaos and the rise of Islamic State and other terrorists. A large portion of these so-called “moderate rebels,” backed and funded by imperialism while fighting the Syrian Army, turned out to be radical Islamist militants. The Pentagon established several programs to help the rebel groups in Syria and later sent troops to Syria without permission from the UN or Damascus. The US had to admit its training program of the Syrian opposition fighters had failed as it proved difficult to find enough “moderates,” and some of those who did receive training infamously gave up hardware and arms to terrorist groups, including an Al-Qaeda affiliate. Previously, Venezuelan Ambassador to Syria Jose Gregorio Biomorgi Muzzatiz noted that the crisis in the Latin American country was similar to the situation in Syria in 2011. “The policies of some Western countries, led by the United States, in relation to what is happening in Venezuela, their brazen interference in its internal affairs, as well as the sanctions and embargo imposed on the country, have become the standard method to put pressure on countries that disagree with their agenda,” the Syrian President said in a statement. “What is happening in Venezuela is similar to the events in Syria; their [US and their allies] purpose is hegemony over countries and appropriation of their sovereignty in violation of international law and the principles of the UN Charter,” he stressed. Arreaza has stated during a meeting with his Syrian counterpart, Walid al-Moallem, that Syria and Venezuela are facing the same US conspiracy against their countries and vowed that both would emerge victorious in the end. “I agree with Minister al-Moallem that the US conspiracy which is targeting our countries is one. The Venezuelan and the Syrian people are resisting the imperialism and the US conspiracies and they will triumph,” he said. Arreaza further slammed the US for mulling military intervention as an option to resolve the political crisis in Venezuela and noted that Syria’s experience would be useful for Caracas in its fight against Washington’s plans. “Venezuela will benefit from Syria’s experience in the war against terrorism in facing the US conspiracy hatched against it,” said the Venezuelan Foreign Minister. Since its defeat at the National Constituent Assembly election, the Venezuelan right has been organizing violent street acts as a substitute for its lack of popular support, the Venezuelan Foreign Minister said in Damascus. During a two-day visit to Syria, Arreaza said Thursday that Juan Guaido’s political party has been promoting violence and death in the Latin American country. At a press conference held in Damascus, the Venezuelan Minister said that the opposition politician and self-proclaimed “interim president” Juan Guaido belongs to the “most extreme sector of the Venezuelan right”. His party, Voluntad Popular, “has encouraged violence and death” on the streets of Venezuela, Arreaza said. The objective of this alleged tactic is to destabilize the situation in Venezuela just about enough to provoke internal clashes, the president said. Ever since imperialism stepped up its interventionist acts against Venezuela with help of its proxy-leader Guaido, pro-Chavez-Maduro volunteers have been bracing for increasingly likely military intervention. They are ever ready to defend the Bolivarian Republic from its enemies – internally, proxies, and externally, imperialism. 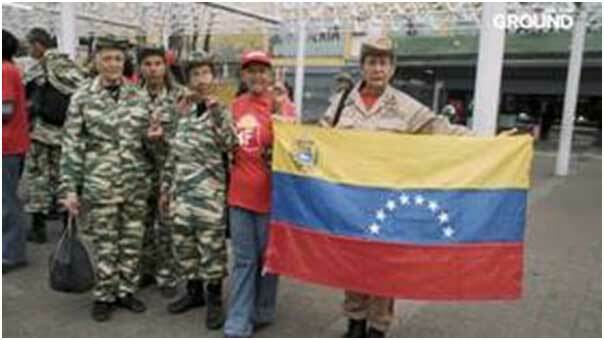 Known as Colectivos, the leftist citizen’s militia was organized in 2008 to help Venezuela’s armed forces to secure the gains made by the people, especially the poor. Former President Hugo Chavez initiated the gains. The citizens participating in securing the gains are being regularly portrayed in the imperialist media as a “sinister and nefarious” group, as “hoodlums creating terror”. With 1.6 million members, or 1-in-20 Venezuelans, the movement is much more than just a part-time paramilitary force and a nationwide citizen militia. “I’ve learned to read and write,” said Yanira Rusa, one member of a colectivo. Yanira is now studying at university. She added that the militias have given Venezuelan women a greater sense of power and autonomy. “The US doesn’t sleep. At the moment what keeps them awake is Venezuela,” says Guadalupe Rodriguez, one militia group leader. Guadalupe explains the tact with which the US has always wanted to “dominate” Latin America and impose its political will on the continent. Venezuelans do not want war, and recently, on Plaza Bolivar in the capital Caracas, tens of thousands of Venezuelans have gathered to sign a petition to US President Donald Trump, urging him to pull the “military option” off the table. However, one colectivos member told: People should always be ready to mobilize, train militarily and be prepared to defend their country, if they want it to maintain its sovereignty. NATO ministers have discussed during their meeting in Washington the Venezuelan crisis and the visit of Russian military personnel to the Latin American country, US Secretary of State Mike Pompeo said in a press conference on Thursday. During a High Level Business Commission Forum in Moscow, representatives of the Venezuelan and Russian government worked on ways to circumvent a U.S. imposed blockade, which is seeking to stifle Venezuela both in financial and economic terms. Ricardo Menendez, the Venezuelan Vice President for the Ministry of Planning, stressed that the meeting discussed ways to break blockade schemes imposed on Venezuela, and strengthen a new development model to invigorate the economic and strategic relationship between both countries. According to Menendez, Venezuela plans to adopt a cooperation mechanism between Russia and Venezuela, in order to establish new strategies for importing food supplies and general products for consumption. The Venezuelan Vice President said, we are working and distributing a scheme as part of the reorganization of the productive and economic system of Venezuela. This includes the reorganization of the countries from which we import supplies. This means that we will change our suppliers from the international markets. Menendez also informed that both the countries are not only working on food supply agreements, but also on the cooperation for the supply of medicines and a guideline for the protection of the electrical system of Venezuela. The two countries also discussed closer cooperation on science and technology, aerospace, defense, agriculture, electricity, oil and industrial development.